Recently we found ourselves dressed with no place to go. You know, those evening where you had plans and then they got canceled 30 minutes before walking out the door. Dinner was already eaten and workouts completed so the question became what do we do with our evening besides sit on the couch. We didn’t want to spend any “actual” money, so Conner posed the question “what free thing can we do”? First things first, we scavenged around the house to find all the quarters possible. Armed with $10 in quarters (note to self, next date night will involve rolling the change in the house. Who knew?!?) we were on a mission to find the local dessert of King of Pops. Now, for those of you who may be saying “Okay a popsicle? Just go to the grocery store”. Nope, not that simple. These popsicles can only be found at Food Truck events, farmers markets, and on the streets of Atlanta. I knew some specialty foods stores had started carrying locally made treats so we thought that would be the next best option instead of driving all the way to Atlanta. 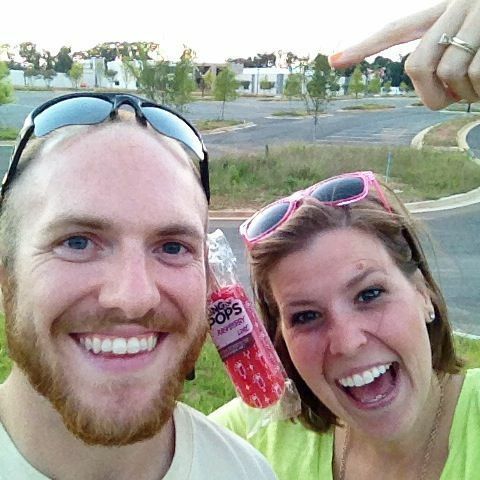 The goal for the scavenger hunt was to find the popsicles before the sunset. So we could, you know, enjoy the treats while watching the sky turn to night. It was quite the adventure; we swung by a Farmer’s market and two specialty grocery stores before finding the treasure! Just in time and we didn’t even use all the change. Woot for ballin’ on a budget!